Keep safe and hide pictures, videos - also app lock secretly by this calculator. 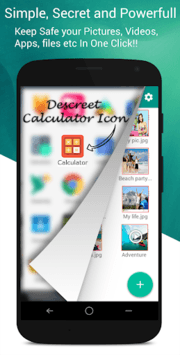 Use this calculator vault to hide pictures, hide photos, hide videos and use app lock secretly inside app. Try this amazing functional app lock and hide pictures so that hidden pictures not visible in photo gallery. Is your old App lock still visible in your phone as "APP LOCK" app? Prying eyes Know which App lock you are using and may uninstall to break your security. This app locker is designed as simple calculator. Calculator vault - Gallery Lock app open only by secret code that is set by you other wise it functional as simple calculator. This way no one knows your mobile had installed gallery lock and you can secretly hide pictures to keep safe from others by this Smart Calculator. - Import and hide pictures, hide video from photo gallery. - Sort files and folder and change view to Grid or list view you like most with smart locker. - Capture photos and record videos from camera by this Gallery Lock and hide photos and video inside app. - Create new private hidden note with inbuilt editor inside Gallery Locker. - Enabling Face Down from settings will let you set the action of taking care when someone came suddenly and you just face down phone. for example close app, open another app or open any website. - Finger Print Detection will help you to enter into vault or open app lock without need to enter password in supported devices. - Beautiful functional Inbuilt Image Viewer has function like slideshow, shuffle and you can set timer of slideshow interval from settings. - Night Mode - view your gallery locked pictures and videos in dim light to Protect Eyes. - Use restore function from Gallery locker when you want to show pictures and video in mobile gallery. - You can manage media by create, rename, delete folders and files inside app. - Lock Apps by App Lock feature available by both Password Lock and Pattern Lock. ☆ Intruder Selfie: Selfie will be automatically taken of person who trying to break your app lock security with wrong PIN or pattern. ☆ Fake Cover App Lock: your apps and its lock can be cover with force close screen which simulates that opened app is closed by error. only you know the trick to get real app lock and open your apps. ☆ Finger Print Unlock: you can use your real fingerprints registered in your phone to quick unlock apps and calculator also. ☆ Switches Lock : take Control over Phone's wifi/Bluetooth Switches. ☆ GIF playable photo viewer. ☆ Photo Slideshow by folder hidden photos and GIF. ☆ Video player to watch videos inside video locker. ☆ Text editor to manage personal hidden notes. ☆ EQUAL TO UNLOCK : Need to Press Equal button after enter correct password into calculator to open Calculator Vault app. ☆ UNINSTALL PROTECTION : Prevents this app to uninstall and protect photos, videos and app locker. This app uses Accessibility services. You can enable accessibility service for this app from our Applock's Settings. By enabling accessibility service our app can provide you faster app lock and saves battery power. We make sure that app only uses information that is required for app lock improvements and nothing else. 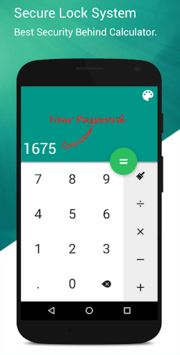 A Calculator Vault - Gallery lock is Secret, No Locker icon found, No Locker Name found anywhere, Not Found Any app Locker in Application Manager, Light weight app with beautiful design and user interface. Q - Forgot password. How can I reset it? A -To reset password you have to open our Calculator and enter 11223344 and press Equal button. It will open password reset screen with secret question set by you, answer it correctly and set new password. Q - I uninstalled this app and again installed. Can I get my locked pictures back? A - You need to unlock pictures before uninstall. Files are not available in new install.